Just a quick warning before you carry on reading: this blog contains spoilers, so go watch the movie first, unless you want me to ruin the whole plot for you. So you might have noticed that in my last blog I said I’d recently watched The Notebook, which is based on the novel by Nicholas Sparks… you know, if you were confused as to which Notebook I was talking about… Anyway… I also mentioned that you should go watch it, because it made me cry. Let me just clarify something here: The Notebook is by far THE soppiest, most utterly gooey, romantic movie I have ever watched in my entire life, and I did NOT cry because it was “romantic.” The way I see it, the bulk of the movie was not “romantic”; it was horribly clichéd, and I couldn’t even watch it in one sitting because it just made me want to rip out all my hair, stab my eyeballs out with a fork, and then join a nunnery. And no, I’m not saying that it wasn’t well directed, or that the acting was terrible, because the actors were amazing and the directing was fine. I just… ugh. It was SUCH a typical romance movie, with the kissing in the rain and the fights and the crying… except it wasn’t. I liked the old couple. They were cute, and their romance wasn’t too stereotypical, but OH MY WORD the young Allie and Noah were just… No. It was so unoriginal, and I’m sorry, but if you told me to lie down in the middle of the road with you, I would run you over with MY car. I get it. I really do. I get that some people want the whole “Romeo and Juliet” thing with the forbidden love and they want the moments when you kiss in the rain and fight and make up and fight and make up… But at the same time, The Notebook has the saddest excuse for a storyline that I have possibly ever come across. Children’s picture books are more interesting. How is this movie so popular among teenage girls? Are we so obsessed with that clichéd romance that we will spend two whole hours of our lives watching people fall in love, then break up, then fall back in love again and again? And yes, I did cry at the end, but only because she finally remembered, and then she didn’t, and then we found out that she’d written the book that he was reading to her and… oh my word. Then they were talking about their love after he had a heart attack (literally – he had a heart attack) and she asked if he thought that their love could take them away together, and he said he did, and then they died in each other’s arms and I cried. So sue me. I have nothing more to say on this topic. Just… no. I have too many mixed feelings on this stupid movie. Yes it was romantic, no I did not like it, and yes it made me cry. I don’t want to talk about it any more. Feel free to comment below on what you thought of The Notebook, and if you have any recommendations for other films you think I should watch. Don’t forget to subscribe to my posts or follow me by e-mail to be notified every time I post a new blog or review! 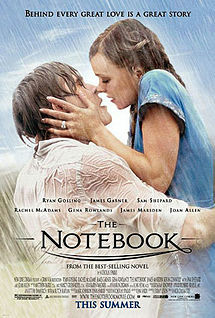 You are the first person I have to say has been truly honest about the notebook! Well said. Cos most of us who hated it, didn't want to admit that the story did actually make us cry. And those who loved it, just loved it without criticism. Also loved the old couple more, and also thought that there have been better story lines in the picture books I read to you as a child!!! Saved me from watching it - Tx! And also, nothing will ever live up to Titanic. Ever. Ever. Ever. Never.